A traveller stopping to eat at the Elements Restaurant in Houston would be surprised at the long and colourful history hidden inside the walls of that cafe. Those walls go back to 1928, when the building was first constructed by E.G. Bellicini as a garage to service the motor cars and trucks of the day. Bellicini recognized a good opportunity when he saw it, for in 1928 there was a lot of mining activity in the area. The building had a good floor. Nancy Goold remembers that dances were held in that garage. "We'd come in on Saturday afternoons with pails and soap and scrub the greasy floor. Then we'd put some powder on it. There was a man from Walcott with an accordion and a mouth organ who played and we would all come out for a dance. The Houston Community Club used to put them on. Everyone worked together in those days," Mrs. Goold recalls. After Bellicini, the garage changed hands many times. In the early thirties, Esther and Frazer McKenzie came to Houston and bought the garage. Chris Sorensen and Harold Silverthorne took turns operating the garage during the late thirties and early forties. Harold Silverthorne also owned and operated Houston's first taxi during those early days. 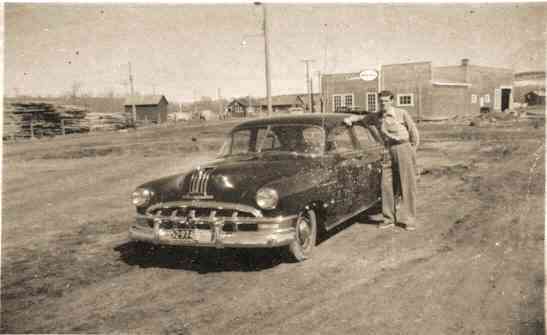 John Veenstra and the Houston Taxi (which he took over from Harold Silverthorne) in 1950 in front of Byman's Garage. Helge Byman bought the business on (V.J. Day) Aug 15,1945. When Helge took over, there was only one car in Houston (John Goold's) and all the rest of the vehicles were trucks. The Bymans rebuilt the garage and operated it for the next 39 years. Helge had taken his mechanics training in 1937 and had arrived in the Houston/Perow area two years later. He first charged $1.50 an hours to work on a vehicle, but forty years later, in 1985, it cost $35 an hour just to break even, he said. Helge never had a problem he and his son Roy couldn't fix, although near the end of his career he noted rather sadly that technology had turned him into a parts changer, not a mechanic. The Bymans sold the garage in 1984. Helge retired to spend more time fishing, and Roy, who had taken over managing the business in the late 1970s, bought a logging truck. An era ended. By 1985, the garage had undergone a metamorphosis. With an entirely redone interior and a new application of siding, the building reopened a year after Byman had sold it. Now it was appropriately called the Landmark Restaurant under the ownership of Langay Chow, featuring both Chinese and Western food. It became affectionately known among the locals as Chow's, although some of the old-timers are creatures of habit. They still call it Byman's garage. Allan and Helen Leung took over the operation in 1992, adding a small gift shop featuring Chinese Arts and Crafts.